Before: My first thought was that the faded rug definitely needed to go. And those poor flower pots were just begging for some foliage. Time to get to work! Stage one simply involved a little bit of elbow grease: Hosing off the patio, scrubbing down the furniture, and clearing out dead plants from last summer. Time for plants! I’m a big fan of container gardening. I find that planting in containers is pretty low maintenance and is especially handy if you are lacking green space. Containers are great because you can rotate or move the pots around in order to ensure the plants get the perfect amount of sun/rain. 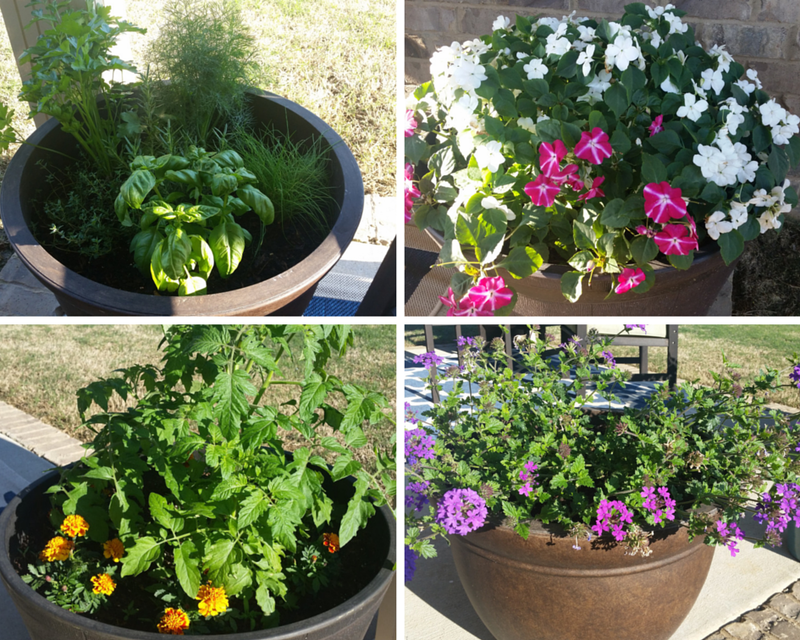 They look nice, they add some character to the space, and you can really play around with different varieties of plants in each separate pot. Herbs: I always always always plant herbs. First and foremost they are beautiful to look at (I just love that pop of green). Secondly, it is really convenient to always have fresh herbs on hand for adding to your dishes. For someone that loves to cook, this is a total treat! Some of my favorites are rosemary, basil, parsley, dill, chives, and thyme. These herbs are great companions to be planted in the same container. I also love mint and oregano, however I recommend planting these in separate containers as they tend to be a bit territorial and takeover the whole pot. Tomatoes: I’ve experimented with many different kinds and they are all fairly easy to grow. However the easiest variety to grow (which also happens to be my favorite) is the cherry tomato. This variety is great for container gardening. A great tip is to plant a few marigolds around the circumference of the pot. They are not only colorful but they also keep some of the unwanted critters away! Flowers: What I love about planting flowers is how many options there are! It’s really fun to get creative with different colors and varieties. 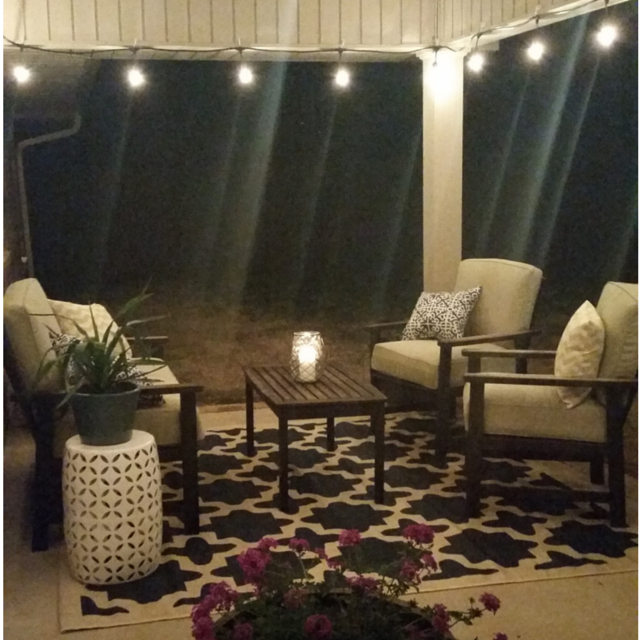 For this makeover I chose impatiens and pentas. I have one corner of the patio that gets very little sunlight, so this is where I chose to plant the impatiens since they do really well in the shade. The pentas are planted in a container that gets plenty of sun, as this is where they do best. When choosing which flowers to plant it is important to research what conditions (sunlight, for example) are best for each variety to ensure your flowers will thrive wherever you plant them. My favorite part…accessories! I always enjoy accessorizing because this is when the space really comes to life. You can be so creative with different colors and patterns. The possibilities are endless! 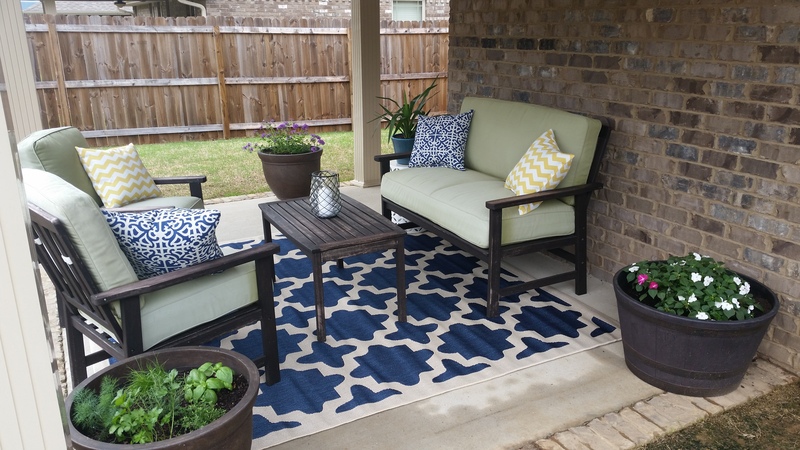 Area Rug: This area rug is definitely my favorite piece on this patio. It’s bold, fun, and really anchors the space. 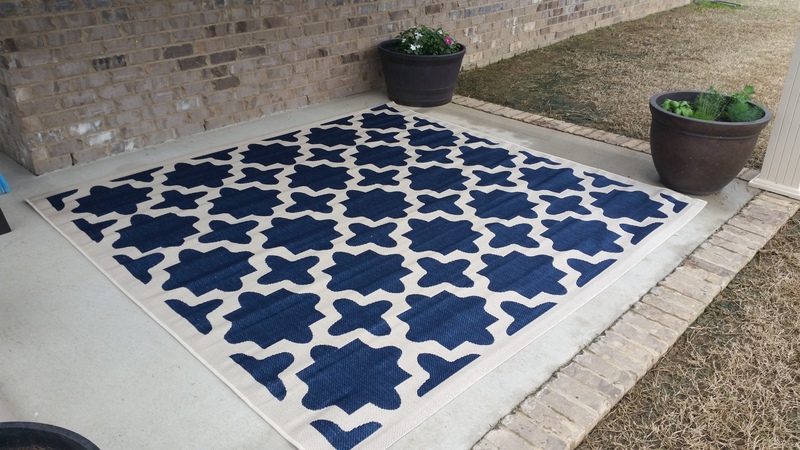 I looked at lots of different colors while shopping for the rug but leaned more towards a darker color (this navy) since it will be less likely to show dirt than a lighter color. And I absolutely love the pattern. Throw Pillows: I’m a huge fan of mixing color and pattern and these pillows are a great example of that. The blue and yellow pillows tie in so well with the green furniture and navy rug. And the mix of pattern really adds some interest. Garden Stool: A garden stool is a great multipurpose accessory that is perfect for any outdoor space. 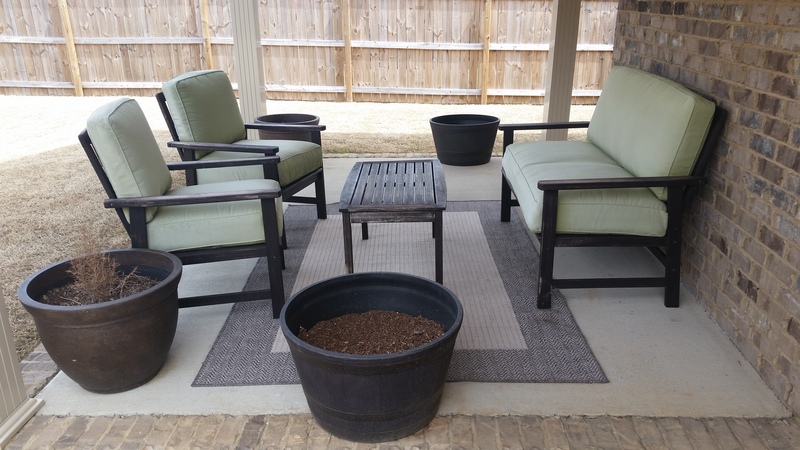 It can be used as an extra seat around the patio, a side table great for setting down your cocktail, or (as pictured) a cute place to display a small potted household plant. 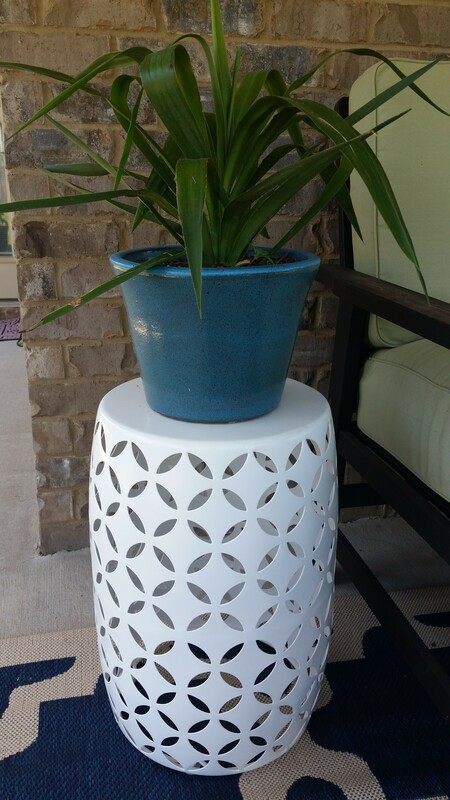 When shopping for a garden stool there were so many colors to choose from, but I love the white because it’s simple and clean. It also helps the white pattern in the pillows stand out. Lighting/Ambiance: I like to refer to this as “the cherry on top” because it’s SO easy to add but makes a huge difference. 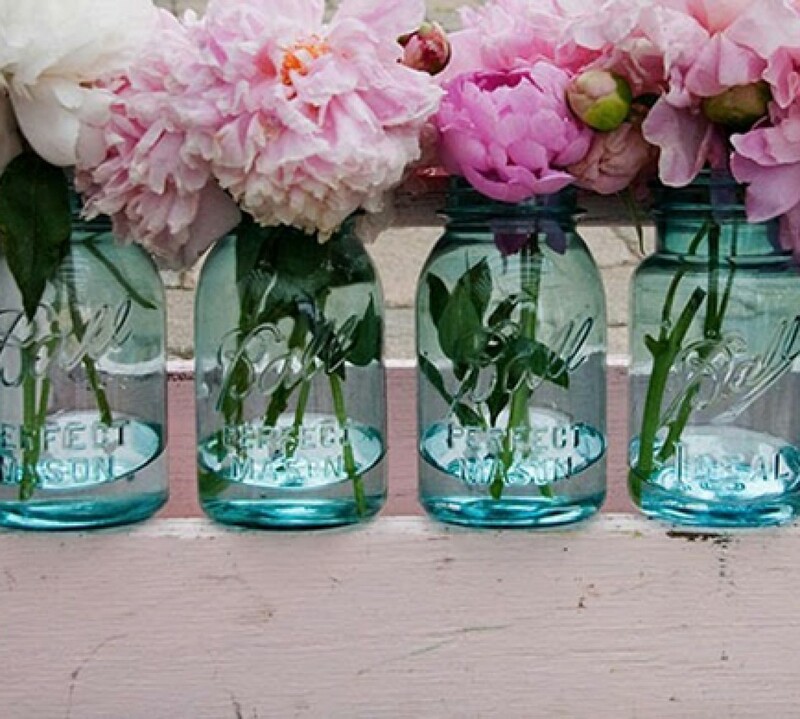 This can be as simple as lighting a candle or hanging a string of patio lights. I happen to have both of these on my patio because I love sitting outside at night which is when these additions will have the most dramatic effect. Tiki torches, lanterns, and solar powered landscape lights would be great ideas as well. 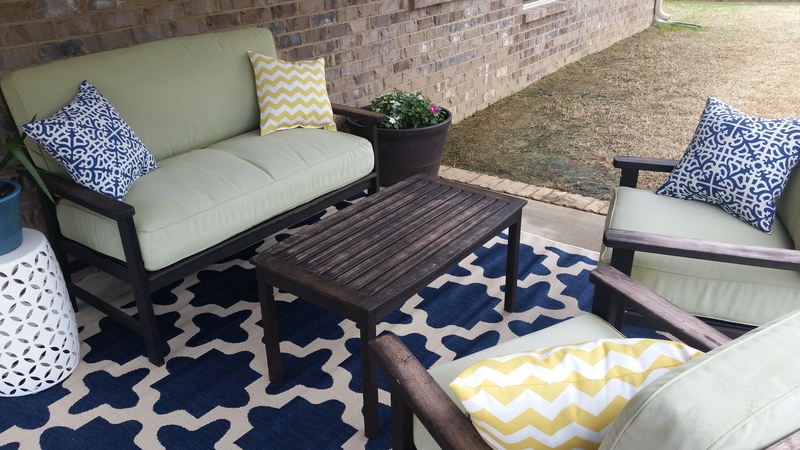 After: A bright, welcoming, happy space ready for springtime patio living! 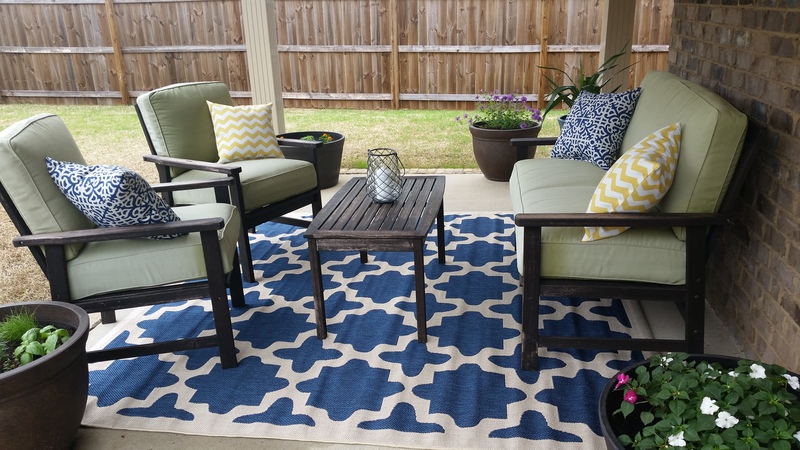 This patio makeover is as simple as that and I am so thrilled with the end result! I updated this space in just a couple of hours. By using pieces I already had and buying a few new “statement pieces” I was able to put this together for just around $250. If you ask me, it was totally worth it! Like some of the accessories you see? Here’s where I found some of these great pieces! Click the links below for more info.